The family history the Lawtons of the Summer Oaks plantation in Thomas County, Georgia. This family history centers around Alexander Benjamin Lawton (1809-1861) and his wife, Narcissa Melissa Lawton (1817-1883). Together, the couple had seven children: Alexander Cater Lawton (1841-1921), Winborn Theodore Lawton (1843-1892), Clara J. Lawton (b. 1845), Robert W. Lawton (b. 1847), Benjamin F. Lawton (ca. 1848-ca. 1853), Thomas J. Lawton (b. 1851), and Emma Lenora Lawton (1853-1907). Lawton also had three children from his previous marriage to Elizabeth Brisbane Lawton (1808-1839): Mary Jane Lawton (b. 1832), Martha S. Lawton (b. 1834), and Eusebia Lawton (ca. 1836-ca. 1850). Part I on the book focuses on the Lawton family background, highlighting William Lawton, Joseph Lawton, Benjamin Themistocles Dion Lawton, and Winborn Asa Lawton. 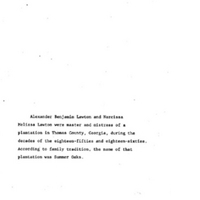 Part II details the immediate family of Alexander Benjamin Lawton and his family while living in South Carolina, while Part III discusses the family's migration to the Summer Oaks plantation in Georgia. Part IV describes the location of Summer Oaks and Part V discusses theories about the location of Alexander Benjamin Lawton's resting place. Part VI details the descendants of the Lawtons of Summer Oaks. This family history was compiled by the great-great-great granddaughter of Alexander Benjamin Lawton and Narcissa Melissa Lawton, Stacey Allene Church and her father, Gerald Marshall Church. Many of the descendants of the Lawtons migrated to Oviedo, Florida. Original book by Stacey Allene Church and Gerald Marshall Church: Private Collection of Bettye Reagan. Digital reproduction of original book by Stacey Allene Church and Gerald Marshall Church. Originally created by Stacey Allene Church and Gerald Marshall Church. Copyright to this resource is held by Stacey Allene Church and Gerald Marshall Church, and is provided here by RICHES of Central Florida for educational purposes only. Johnston, Coy K. Two Centuries of Lawtonville Baptists, 1775-1975. 1975. Lawton, Edward P. A Saga of the South. Ft. Myers Beach, Fla: Island Press, 1965. Rogers, William Warren. Ante-Bellum Thomas County, 1825-1861. Tallahassee: Florida State University, 1963. Rogers, William Warren. Thomas County During the Civil War. Tallahassee: Florida State University, 1964. Rogers, William Warren. Thomas County, 1865-1900. Tallahassee: Florida State University Press, 1973. Church, Stacey Allene and Church, Gerald Marshall. “Lawton Family History.” RICHES of Central Florida accessed April 22, 2019, https://richesmi.cah.ucf.edu/omeka/items/show/6351.